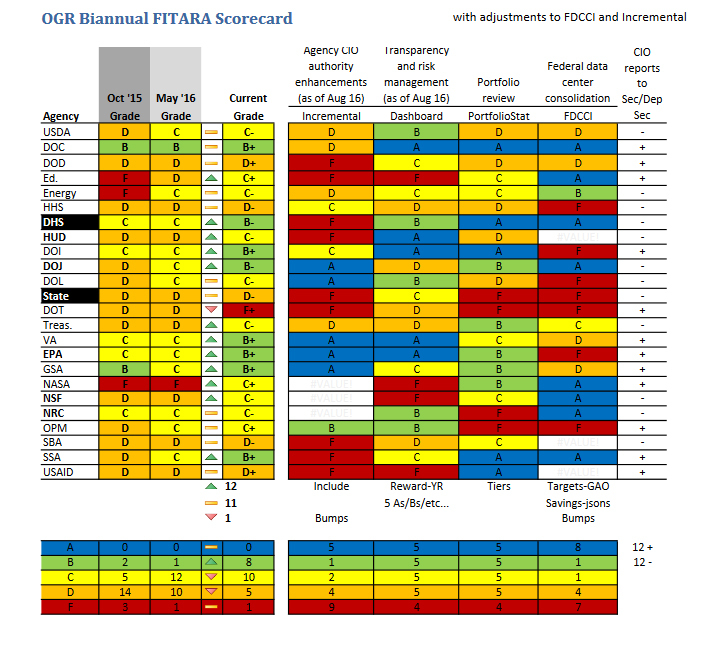 One agency received an overall F on its Federal Information Technology Acquisition Reform Act (FITARA) scorecard—and it was not the agency that has failed the past two times. The Department of Transportation (DOT) dropped from a D to an F+ on the most recent FITARA scorecard, issued Dec. 6. For the past two years, the National Aeronautics and Space Administration (NASA), hub of some of the most advanced technology in the world, received an F. NASA received a C+ this time around. FITARA, an act written by Rep. Gerry Connolly, D-Va., and his colleague Rep. Darrell Issa, R-Calif., is meant to streamline the IT acquisitions process and properly use the $80 billion the government spends on IT. Congress monitors how well 24 agencies enact FITARA mandates through a scorecard, which measures agency performance across four categories, including Incremental Development, Risk Assessment Transparency, IT Portfolio Review Savings, and Data Center Consolidation. Agencies are also given a letter reflecting their overall grade. According to David Powner, director of IT management issues for the Government Accountability Office (GAO), DOT’s disappointing score reflects some deep-seated issues within the agency. Powner said he knew that Richard McKinney, DOT CIO, started his term with his work cut out for him. The December scorecard shows improvement from the last report, which was issued in May. In the May scorecard, agencies’ grades were generally poor. Twelve received a C. 10 received D’s. The Department of Commerce (DOC) received a B, the highest grade. NASA claimed the only F.
December’s scorecard reflects a step in the right direction for most agencies. Twelve agencies’ grades went up, 11 remained the same, and one went down. The scorecard reflects that the Department of Commerce is no longer the lone high achiever. Eight agencies, including DOC, received a B this time around. Ten agencies received a C, and five received a D. No agencies received an A. The scorecard also includes a chart titled “Federal Data Center Consolidation Effort,” which shows that agencies have closed 4,388 data centers as of August 2016; 9,995 functioning data centers remain. According to agency CIOs, who testified at a House hearing on FITARA Dec. 6, data center consolidation is a major priority, in addition to a way to save money. The Department of Homeland Security (DHS) performed well in the data center consolidation category; the agency received an A. Connolly stated that DHS surpassed its savings goal, reporting $248 million from data center consolidation. Luke McCormack, DHS CIO, said that he expects the agency will have fewer than 25 data centers in Fiscal Year 2019. However, Frontis Wiggins, CIO of the State Department, said that data centers are a challenge because the term can be used to define both an entire facility and a “communications closet with single rack of equipment.” He called for a review of the definition of data centers, and said that State plans to close 220 data centers in the next year and a half. Wiggins said this will be a stretch, as the agency has closed six since 2012. In addition to the four grading categories, Congress added to the scorecard a column denoting, with a plus or minus mark, whether CIOs reported to their agency’s secretary or deputy secretary. The scorecard indicates that 12 out of the 24 agency CIOs report to their respective secretaries. Wiggins said that reporting to secretaries and deputy secretaries involves more collaborative communication than the scorecard reflects. He also said he meets with the deputy secretary on a regular basis. State received a minus mark in this category. Connolly expressed concern with the practice of communicating with people “16 rungs down” instead of the head of an office. He also said he was disappointed that State did not report any savings from data center consolidation or IT portfolio review. The scorecard revealed the agency underperformed in assessing the risk in its major IT investments.